BELLEVILLE — "Fortyseven" years of continuous service to the Belleville Philomathean Free library is the record of Miss Florence Kennedy, devoted librarian at Belleville, who has also donated many of the hours of service at the library. A committee from the board of trustees is planning an open house for Miss Kennedy on Thursday, April 27, from 2 to 4:30 p.m. at the home of Mrs. Mae Ormsby in Belleville. Miss Kennedy is not retiring, but is looking forward to many years of additional service with her books at the library. It is with a great deal of pride in our librarian and a tremendous desire to extend to her the "congratulations of a grateful community" over the years, that this open house is planned for her. As the' week of April 16 to 22 is designated as National Library week this year, it is a fitting time to honor our librarian. The total circulation from the Belleville Philomathean Free Library during the year 1966 was: 3,155 books, 275 films, 20 records, 205 magazines, and 5 pamphlets, or 3,660 items loaned. Of the books loaned, 2,295 were to to adults and 860 were taken out by juniors and children. The library hours at Belleville are 1:35 to 5 and 7 to 9 p.m. The North Country Regional Library System service was offered to the Belleville library in 1948. Many of the books are offered on a loan basis from the system for three months, with some special books which could be more in demand and are allowed one month. Library memberships are offered to anyone who so desires, at one dollar a year, payable in January of each year. However, they are always acceptable, along with any contributions offered by interested residents, whether they make use of the library or not. This is gratefully accepted in behalf of the library membership by Mrs. Gertrude Chapman, treasurer. The board of trustees of Union Academy, Belleville, voted a sum of money to aid in maintaining the village library. The town of Ellisburg honors a contract to provide each of the three libraries in the township the sum of $100 each year. These libraries are Mannsville, Ellisburg, and Belleville. The Philomalheon Free Library association of Belleville, is proud of its heritage and its record through the years.lt received a certificate of establishment of a new library at a legal meeting held Dec. 8, 1904. Eleven members of the committee voted. "That a free library be hereby established for the free use of inhabitants of this village in accordance with the laws of 1892, ch. 378." Officers were elected and it was voted to hold annual meet ings the second Tuesday in July. The sum of $100 was appropriated for maintenance of said library. 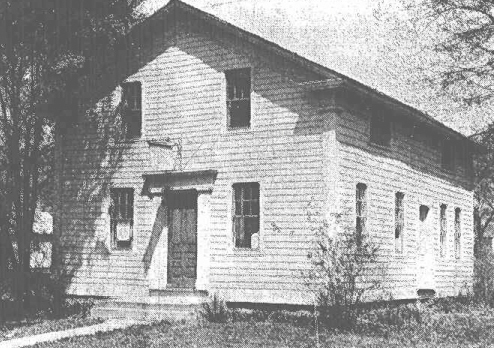 It was then housed in the Overton block which is now the Village tavern, owned and operated by Mr. and Mrs. Earl Gilbert. "Philomathean" being the Greek word for "Lovers of Learning," it was the name chosen for the Belleville Library association. The Philomatheans, in 1903, paid transportation on some books from the state library, as well as for "My Thirty Years in Washington," by Mrs. Logan, which book as noted by the records "will form the nucleus for the library for the future." The next year, 1904, it was again suggested that a library be started in Belleville by the club. Several people gave $1 apiece toward a fund to start the library. Benefits were held for this cause, such as selling old shoe rubbers, rubber boots, etc. The library was admitted to the University of the State of New York, December 8. 1904. It was to be available for Belleville and vicinity, as well as two other libraries. Union Academy and District school in Belleville. A provisional charter was issued for the library in 1905. Five dollars was received from the sale of the old rubber, conducted by a Mr. Will Wright. In 1910 the library received an absolute charter, which it still possesses. In 1933, after continuing the Philomathean study club for 30 years, it was voted to discontinue meetings and all their money was given to the library. The building in which the library is housed dates back to the 1820s, and is believed to be the oldest building in Belleville now that. the old stone block on the corner has been torn down. It was purchased from Sam Keyes in 1909, after its use as,a library for the year 1908. The club gave a play in 1921, raised $167, and donated it to the library fund. Mrs. Abbey (Jack) Fulton was one of the first librarians. It was voted to elect a trustee each year to serve for five years on Dec. 8, 1904. Mrs. Etta Waite, at one time a librarian, was followed by Miss Henrietta M. L. Eggleston, who was librarian until Miss Kennedy was appointed. Mrs. Florence Mather, still a resident of Belleville, who borrows books from the local library, was one of the first borrowers, beginning in 1904, when the library was organized. She was a member of the first committee to pick out some books when the library was formed. Her interest covers a continuous span of 63 years, for she has always lived near enough to visit the library for books and has maintained her membership therein, although she did resign from the library board in. 1958. One interesting note of the early library concerns an outdated system of "book reserves," which meant the librarian would pull a book to be reserved, off the shelf-, and put it behind her on her chair. Sometimes the system outgrew the equipment, and the librarian found herself with almost no room to sit down. Next they had a system whereby they paid a charge of two cents to "reserve" a book, and those books were kept on the "reserve shelf." There is no charge now, unless a book is kept past the return due date. This makes it more understandable as to why there is a constant need for money to maintain a local "free" library. Officers of the Belleville Philomathean library for the year 1966-67 are: Mrs. Richard Sivula, president; Mrs. William Eastman, vice president; Mrs. Ross Esty, secretary; Mrs. Niles Chapman, treasurer and trustees are Mrs. Sivula, Mrs. Eastman, Mrs.-Esty, Mrs. Harry Jones, and Mrs. Stewart Ormsby Mrs. William Eastman was elected to the board to fill the vacancy caused by the resignation of Mrs. William Mather. Note: Some entries on this site may not directly relate to Belleville but are connected in some way to an individual that was born in Belleville or lived in Belleville as part of the local community.